Should Organizations Retire FTP for Security? Should Security Concerns Make You Think Twice About Where FTP is Used Within Your Organization? Web hosting firm DreamHost made headlines this past weekend when it opted to reset the file transfer protocol (FTP) and shell access passwords of its customers after uncovering a possible data breach. But it wasn’t just the prospect of the company adding its name to the list of organizations affected by data breaches that had some talking. Instead, the move led to Adam Bosnian, executive vice president at password and identity management vendor Cyber-Ark Software, to question whether or not it’s officially time to put FTP on the shelf for good. Talk of security problems with FTP is not new. FTP was not designed to encrypt its traffic, making it possible for attackers to sniff packets on the network. A common answer for this is to use FTPS, an extension for FTP that supports the transport layer security (TLS) and secure sockets layer (SSL) protocols. “Furthermore, having the ability to know if the files were transferred correctly and on time is very difficult to do with transfer methods such as FTP,” he added. Part of the issue is that people have higher expectations for the FTP protocol than they need to have, said Hugh Garber, senior product marketing manager at Ipswitch. Unfortunately, many organizations are still relying on outmoded FTP to move and transfer mission-critical or sensitive information and that introduces risk, he said. FTP lacks many of the management and enforcement capabilities that modern Managed File Transfer solutions offer, he added. In addition, organizations should proactively work to remove all hard-coded clear-text passwords from their FTP scripts and systems, Bosnian said, noting there are commercial products for replacing, securing and managing vulnerable credentials frequently found unsecured within FTP scripts, servers and applications. 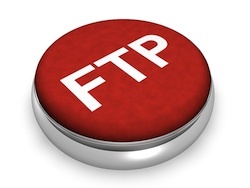 Retiring FTP may make perfect sense from a security perspective, but so does killing reusable passwords, group accounts, hardcoded passwords and so on, opined Gartner analyst John Pescatore.